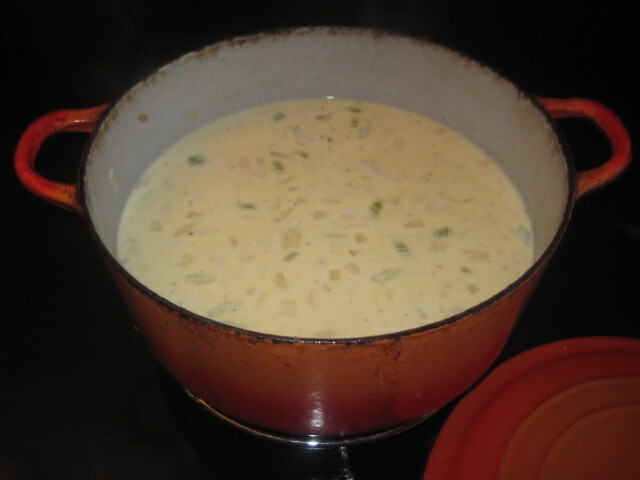 The other night I made some yummy corn chowder mostly following this recipe from Paula Deen of the Food Network. I’ve used this recipe in the past and the chowder was delicious, but I balked at the amount of butter the recipe calls for (1 cup–that’s two sticks!). So, I modified it this time around. I used 1/4 cup of butter and 2 Tbsp flour (instead of 1/2 cup). Also, I added 2 Yukon gold potatoes, peeled and chopped into bite-size pieces. I simmered the potatoes with the corn and chicken stock for about 10 minutes. Finally, I cut up about 1 cup of cooked chicken and added it to the soup just before adding the half-and-half. I used chicken in this recipe simply because I had some in the fridge that needed eating (it represented the final bits of the rotisserie garlic roasted chicken that I bought a few nights ago and wrote about here, and here, and here. Other than these changes, I followed the recipe closely. The soup was delicious, easy, and inexpensive. We paired it with spinach salad and big chunks of sourdough bread for dipping. It was the perfect meal for a cold winter’s night. The only drawback: Charlie wouldn’t touch it, but that was to be expected. He ate a grilled cheese sandwich instead. This makes 8 servings of soup, so the total per serving comes to just $.84. And, doesn’t it look yummy? Yeah, that pot has seen a lot of mileage. I think it was a wedding gift for Mom and Dad (they still have a bigger version). Mom gave it to me about 10 years ago and I’ve been loving it ever since.